Milk Chocolate (Sugar, Cocoa Solids 33% (Cocoa Mass & Cocoa Butter), Milk Solids 30%, Emulsifier (Soy Lecithin), Vanilla Flavour), Peanut Butter 36% (Peanuts 98%, Stabiliser (Hardened Canola Oil), Antioxidant (E306). Milk Chocolate contain 33% Cocoa Solids, 30% Milk Powder minimum. So good it makes Cadburys taste like plastic. This chocolate is beautiful! 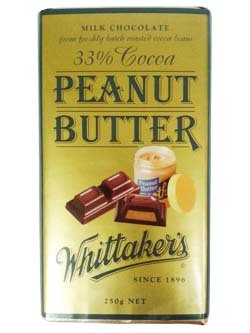 I had it whilst in New Zealand earlier this year, whittakers chocolate is simply the best!! !